One of THE best parts of owning a boutique is ordering clothes! Brooke and I get so giddy when we find that perfect pair of pants, or that tres chic pencil skirt. That being said, it's not as simple as just buying what catches our eye. Have you ever wondered why we order the clothes we do? To be totes honest, there are multiple contributing factors. Season, cost, trends, demand, vibe/aesthetic, and current inventory are just a few of the aspects we consider. It's not just about what we like - if only! We work hard to bring you quality products which honor our low price point - and that can be a challenge for sure. But bring on the challenge! Brooke and I have pretty similar styles. This is good news because, after all, we do own a boutique together! However. There are a few things we disagree on, which is actually a benefit. Marrying our styles when ordering our products gives you the best of both worlds. Brooke is the queen of comfort, while my tastes are a bit more...diverse. I don't identify with just one style genre. I feel like there are just way too many options out there! This isn't to say I'm indecisive and don't know what I like - not the case, my friend. My first rule of style - know what you like and what makes you feel like you. You feel me? Every shipment Brooke and I try to order one "wildcard" - a fun piece people will either LOVE or loathe. You gotta have a little fun in life, yes?? Okay, enough lecturing. 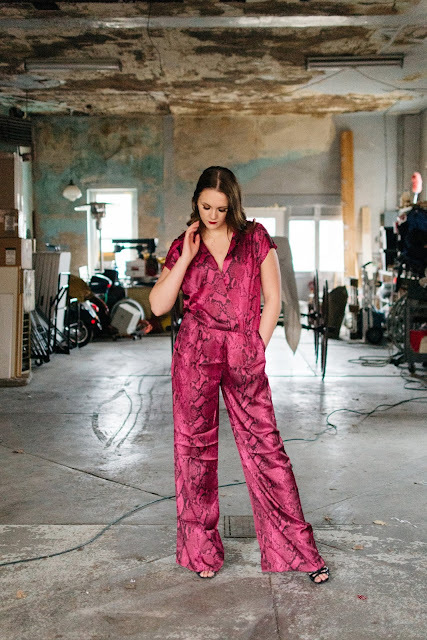 Get a load of our latest wildcard: our magenta jumpsuit. HELLO ferocity. I wore this to a party for hubby's work. It was a hit! I'm so glad I purchased!